Rugged viewing conditions require more rugged binoculars. PENTAX full-size binoculars overcome the challenges of harsh weather conditions and rough handling while providing outstanding optical performance and exceptional durability. From hardy, waterproof designs to award-winning image clarity, these high-performance models continue the PENTAX tradition for excellence and quality. Available in a variety of styles and magnifications, PENTAX full-size binoculars are perfect for an assortment of extreme applications in harsh climates. 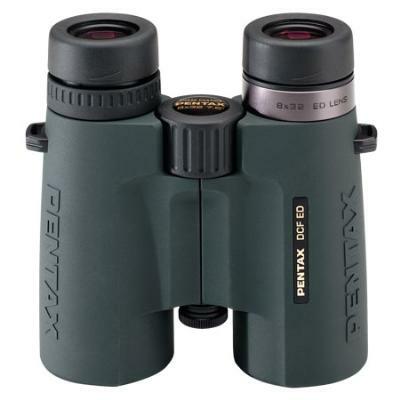 The PENTAX DCF ED binoculars combine Extra Low Dispersion glass elements, full reflection and phase coated prisims, hybrid aspherical lens elements and fully multi coated optics. Built to last with JIS Class 6 waterproof construction, DCF ED binoculars feature a durable magnesium alloy body and a hard coating to protect exposed lens elements. The PENTAX DCF ED 10x43 binoculars combine Extra Low Dispersion glass elements, full reflection and phase coated prisms, hybrid aspherical lens elements and fully multi coated optics. Built to last with JIS Class 6 waterproof construction, DCF ED binoculars feature a durable magnesium alloy body and a hard coating to protect exposed lens elements. Click the button below to add the Pentax DCF ED 10x43 Binoculars to your wish list.